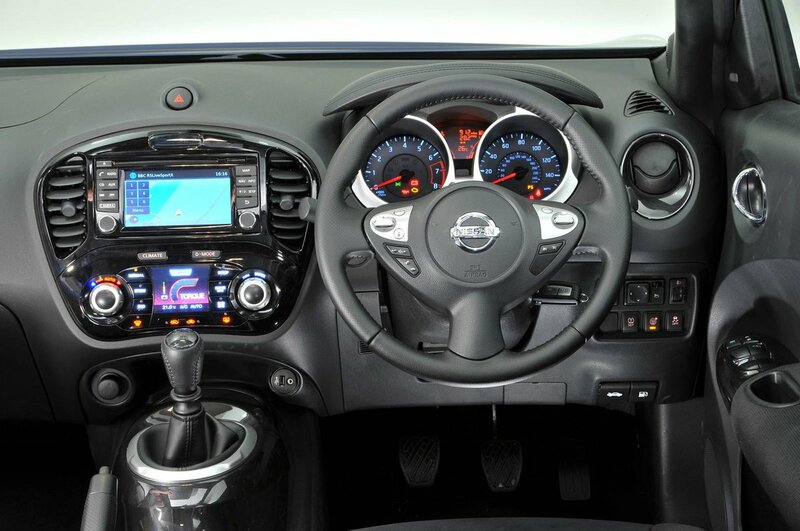 Nissan Juke Interior, Sat Nav, Dashboard | What Car? Getting comfortable in the Nissan Juke won’t be easy for everyone. The front seats are relatively supportive but the backrest adjusts via a plastic handle, with stepped adjustment that means you’ll struggle to find the perfect position. The steering wheel can be moved up and down, but not in and out, so, if you have short arms, you’ll have to slide the seat forward to reach it. Consequently many drivers will find their seating position is compromised and not as comfortable as it should be. All the major controls are clearly labelled, though, but the climate control switches are a little confusing at first. 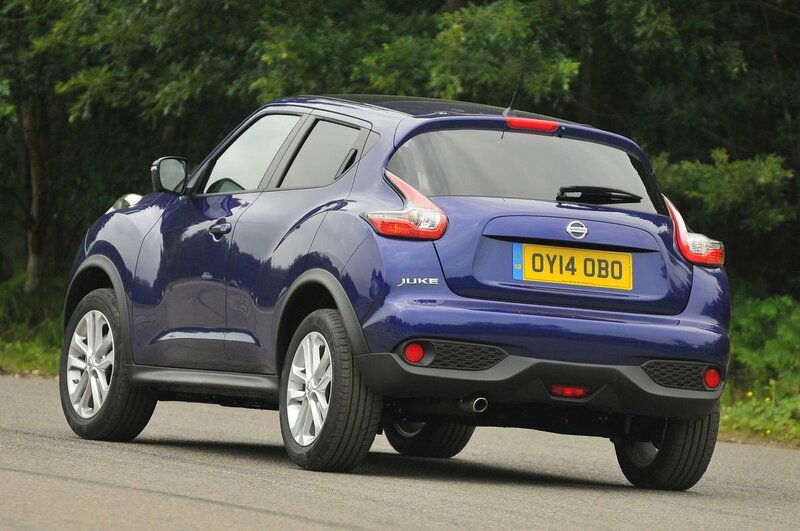 This is one area where the Juke really struggles, particularly when compared with boxier rivals such as the Kia Soul. Its shallow rear screen, small windows and thick pillars make it tricky to see what’s behind you. Fortunately, Acenta Premium models and above have a colour reversing camera. A 360-degree Around View monitor is standard on Tekna models, and optional on Nismo RS and Acenta Premium versions. It gives the driver a bird’s eye view of the car when trying to park in a tight spot. It’s a great feature if you find parking a chore. The view of the road ahead is otherwise much better than from a conventional hatchback, with the higher seating position enabling you to see farther. When it comes to infotainment, there are clear distinctions between trim levels. Entry-level Visia goes without Bluetooth and even a USB connection, while, to gain steering wheel-mounted audio controls, you need to step up to Acenta. Not surprisingly, top-spec Acenta Premium and Tekna versions are much better equipped. Their features include a 5.8-inch touchscreen media system with sat-nav, a DAB radio, Bluetooth and USB connectivity, as well as an upgraded stereo system. The sat-nav is fairly responsive to inputs and the menus in the media system are simple and easy to navigate. Pairing your phone is a fuss-free process, too. 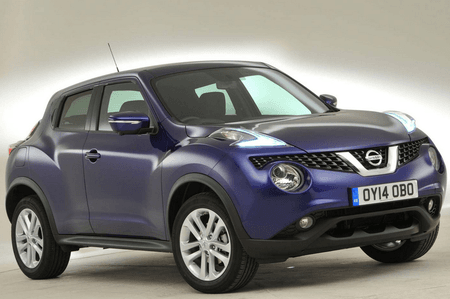 The Juke trades on its striking exterior, so it’s a shame its interior isn’t as smart. A lot of the plastics are hard and scratchy to the touch, particularly lower down in the cabin. The climate controls are a bit clunky and, curiously, also double as the driving mode switches – a novel idea but one that isn't very intuitive. The lids of the glovebox and armrest cubby feel flimsy, too. On the cheaper versions these things won’t be so much of a problem, but if you’re paying for a more expensive Tekna or Nismo model, they’ll be disappointing.